Getting backlinks is an SEO tactic that never gets old. It is one of the most efficient and productive methods that guarantee an increase in search result rankings. Through backlinks, site visitors can gauge the credibility of the contents posted on the website. Think of it as trying a restaurant or availing of a company’s service for the first time. Before entering into an agreement, you first do your research to see if they are worth the time, effort, and investment. You also ask friends for their feedback and if it’s positive, that’s the only time you feel confident about your decision. That positive feedback or recommendation is what a backlink does for your website. Thus, the more quality backlinks a website has, the higher its credibility. As an aftermath, the website gets ranks higher in search engine results. 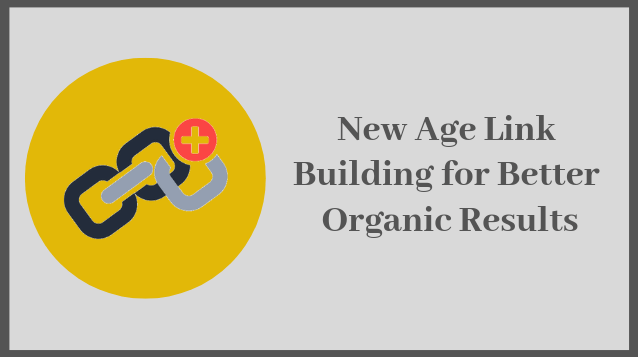 So, in this post, we talk about the new age link building to improve organic search results. As mentioned earlier, backlinks are a vote of confidence for your website. This shows they approve of and are impressed by the quality of the content you post. The fact that someone else is willing to credit you and cite you as their reference means there is something valuable in your website. Tools that measure how trustworthy a website is focused on domain authority. The basis of this metric is the size, popularity, trust-related indicators, age, and link data of the website. The scale is from 0 to 100, with zero being the lowest. If your website is on the higher end of the scale, then it will also have high rankings on different search engines. This is why you need to make sure that you only build high-quality backlinks. One more core point that needs to be taken care of is the traffic of the website where you build backlinks. So, now that it’s 2019, what New Link Building Strategies will work for you? This strategy is right at the top of Neil Patel‘s list but you may want to check out first if this will work for you. It involves creating parody websites and fake products. Again, this is risky so you need to assess if this strategy is right up your ally. If you wish to pursue this, you need to execute it properly or else you can draw a lot of negative publicity. Simply put, the strategy is about pulling a prank on people. If you take a look at topics that have been trending lately, it has a lot to do with humor, products that solve problems, or trivia that’s too good to be true. While the end goal is to have a lot of backlinks, a lot of it also has to do with being credible or at least faking it until you make it. Most website owners who tried this strategy now have a lot of backlinks, which means the strategy worked. They too, however, have received boos from people who are not too happy about the prank. Pranks aside, you can also pursue the Edu backlinking method. Edu sites are not just a high-class domain but they are also enriched with the huge trust, authority, relevance, and traffic that many businesses desire. Though these backlinks are difficult to build but as long as you know how to deal by using various outreach processes, you can get these links. Edu links can Skyrocket your link building efforts and you can find these links by looking at Resource Pages, Scholarship Sites and moreover by paying the authors with.Edu Blogs. Some SEO sources suggest questions posted online by people from different parts of the world. While Google is known for doing a swell job at this, there are still some questions out there that Google cannot answer. This is where you come in. You can join a forum to provide answers and share what you know about certain topics. You can also suggest that they visit your blog so they can look for other articles on your site that may be helpful to them. This can range from answering various problematic questions and if your online content solves their problem, there is a high possibility that they will visit your website. Sites like Quora can be a good source to increase website traffic. Content marketing is a link building strategy that has been there since the very beginning. It is still the “most legitimate”, and top bloggers and SEOs commonly follows this. Fresh content, especially if it is well-written, can already generate a lot of backlinks. The strategy is simple, but it is also risk-free since all you have to do is good research, write well, and make sure that you are not plagiarizing anything. The good thing about content marketing is you can go back to the articles that you’ve written in the past and revise them so they still become relevant. Sometimes simple tweaks already mean a lot, especially if it’s going to be read by a fresh set of eyes. This also saves you time and effort. You don’t need to write new articles all the time; sometimes you just need to be creative. Sharing your content on social media is that icing on the cake which will return a lot of target users. Your social media can even work well when you post differently and design interesting images and graphics. You can organize a meet-up with other bloggers or with the people who follow you online. While interactions online are fine, conversations done face-to-face are still more meaningful. This also allows you to know more about your followers and other bloggers so you get a feel of what topics to talk about on your website in the future. Traveling to different places will also give everyone a different experience. You can visit different tourist spots, dine at restaurants, and blog about it. This strategy is so simple but it will give you an abundance of backlinks. Building quality backlinks do not cost an arm and a leg. It also is not rocket science. It is about being creative with your strategies and knowing what content engages your followers or site visitors. It helps to remember expertise, authoritativeness, and trustworthiness. There has to be a tone of confidence in the content that you upload, whether it be an article, photos, or videos. The reader or viewer must feel that you know what you’re talking about and that you have a certain level of expertise in your field or industry. This way, they will be comfortable using your site as a source. The backlinks will come, of course since references need to be cited. You also need to be authoritative and trustworthy. It helps when you put in your sources or references for the content and articles that you upload. This shows readers and viewers that you took the time to do some research before working on the content. This also sends the message that you take your website seriously. By doing this, you become an authority and you gain the trust of the people who use your site as their source. Since they think that you are reliable, they will link back to your website. Make it fun for people to navigate around your website, and ensure that the content you upload is interesting and engaging. Adding a little bit of humor also helps especially when the topics you intend to discuss are a bit heavy or technical. Organic Traffic – Why it is the best Source of Traffic? Good post. These are some new strategies which is worth trying. It is important to try out new things and get a boost to your ranking.